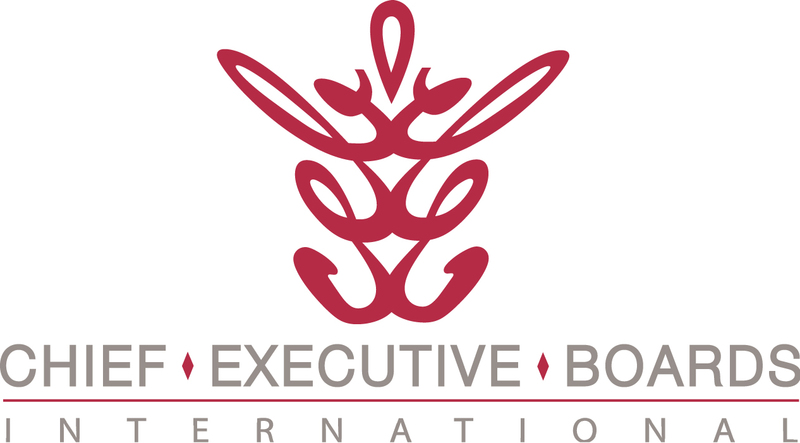 In a recent Chief Executive Boards International meeting, a member made a profound observation from his experiences looking at hundreds of potential portfolio companies for investment by his private equity group. He said: "Small businesses have an uncanny ability to operate right at or above the breakeven line." I looked at him somewhat quizically, and he explained that "For some reason, people will do almost anything to keep from losing money. For some even stranger reason, they won't go ahead and do enough to actually make some real money." I had to agree. I have seen companies who wouldn't do anything at all to get better, but when faced with a decline that might put them in the red, they'll take the harsh medicine necessary to keep that from happening. Another member once told me that people respond far more aggressively to a threat than an opportunity. In his words, "How hard will you fight if I say you can make a million dollars vs. how hard you'll fight if I say I'm going to take a million dollars away from you?" Point well made. So, what causes that "barely breakeven syndrome"? One example, our member said, is the way small businesses react to a business decline. His assertion is that they generally fail to calculate in full the measures necessary to either get profitable or to react to a decline in sales or margins. Here's a likely scenario, with a graph to illustrate. Let's imagine a company whose gross margins are well above fixed costs, thereby generating a reasonable net profit. Then something happens that puts a squeeze on gross margin -- perhaps price pressures from a competitor, economic factors, rising material costs, etc. 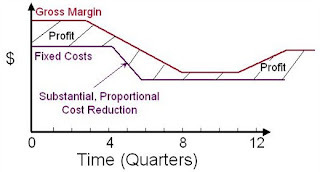 As the gross margins drop through the point of breakeven with fixed costs, management acts -- usually a little too late -- to reduce fixed costs. And the fixed cost reduction is just enough to restore profitability. Remember that uncanny ability to operate just above breakeven? The same scenario is repeated two more times, each generating a moderate losss, until management gets it right, and fixed costs are finally reduced below the falling gross margin. Then, thankfully, gross margins improve enough to restore some profitability. In this scenario, management has good financial instrumentation and understands how to read it. Solid monthly financials that accurately match cost and revenue month-by-month foretell the decline of profitability. Backlog tracking and sales forecasts fortell its duration. Management acts with a calculated plan to reduce fixed costs, either month-by-month, or in a single substantial act, to maintain profitability, even during the downturn. First, that many small businesses simply don't pay enough attention to the quality and timeliness of their financial data. It thereby provides them not only misleading information, but also provides it too late to be useful. Small businesses likewise generally don't analyze and forecast, but rather react. A small reaction to a small loss. And another and another. Chasing the decline in margin with cost reductions, losing a little money and making a little money month-by-month on the way down. Secondly, instead of well-defined profit and performance targets that they strive to make, managment reacts most aggressively to avoid losing money. It's like addressing a golf ball on the tee box, where your self-talk is "Don't slice." Any golf coach will tell you that's not likely to reduce your handicap. Upgrade the quality and timeliness of your bookkeeping and financial reporting. You need solid, accurate revenue and cost information on a weekly basis, if possible -- at worst monthly. Manage your business on an Accrual Accounting basis, even if you're a cash basis taxpayer. The period (week or month) in which you invoice (realize revenue) should also be the period in which the costs hit the books. If you're making money on an accrual basis, you can't help but make money on a cash basis -- it's just a matter of timing. Use Inventory and Work-In-Process accounting to make sure costs are collected on the balance sheet, and held until the revenue is realized and the costs transferred to the income statement. Again, you want to keep Inventory and WIP changes from whipsawing your accrual results, thereby throwing your financial instrumentation out of calibration. If the accounting steps to implement the above concepts are not crystal-clear to you, hire some help from the outside. You could be well-served by investing in some cost accounting and financial report interpretation know-how from a resource you can hire by the hour or on a monthly retainer. This may not be your CPA, but rather someone with a good financial & operations background. That was the other underlying assertion in this member's observation -- that many small businesses simply set their performance sights far too low. Again, in my experience, a reality. I've seen businesses shooting for 4% net profit, when 10% is, in fact, attainable. Think about that one -- 2.5 times as much profit for exactly the same amount of work -- why not?? In many cases, businesses regard "working harder" as a strategy. A value system, perhaps, but not a strategy. Possible strategies might be raising prices or reducing costs -- two things that would actually improve the Net Profit to Sales ratio. Doing more work for the same mediocre results is not a strategy -- it's a downward spiral. Sometimes it takes an outsider's perspective to jostle a business out of its comfort zone. Do you believe (or have you observed) that "small businesses have an uncanny ability to operate right at or above the breakeven line?" Would you click "comments" below and share your viewpoint?